Not Just Another Mother Blogger! : A Visit! When Ann, a friend from high school messaged me and said she would be in San Antonio a couple of weeks ago, I was so excited. Bonus! My high school years were important to me because I finally got to stay in one place long enough to make some real friends, and Ann was one of them. I couldn't wait to see her again. I know that I talk about my introverted ways often. I know that I exhibit the social ineptitude of the classic nerd, along with a tendency to say the wrong thing and trip over my own feet. I'm okay with that. I may have moved around quite a bit, but I did manage to make some friends along the way. It has been a fortunate side effect of Facebook that I've been able to connect with some of those friends again. After high school she ended up in Colorado working for NOAA. She and I both ended up having children later in life; her daughter is a year older than my son. I drove downtown to meet her after work. I was a little nervous. We'd likely changed so much from high school. What if she didn't look anything like me? What if she was a vegetarian? What if she'd become one of those extremely conservative people? What if she'd found religion, and it was Mormon? What would I say to her, after all these years? Thankfully, Ann still looks exactly like she did in high school, or at least enough that I recognized her. We hugged, and I asked if she'd been able to see the Alamo yet. "You mean that big red brick building?" was Ann's reply. THIS is the Alamo. Remember it. There will be a quiz later. 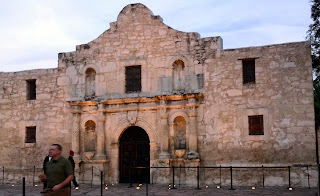 Since a visit to San Antonio must include at least a drive by of the Alamo, that is the first place we headed. 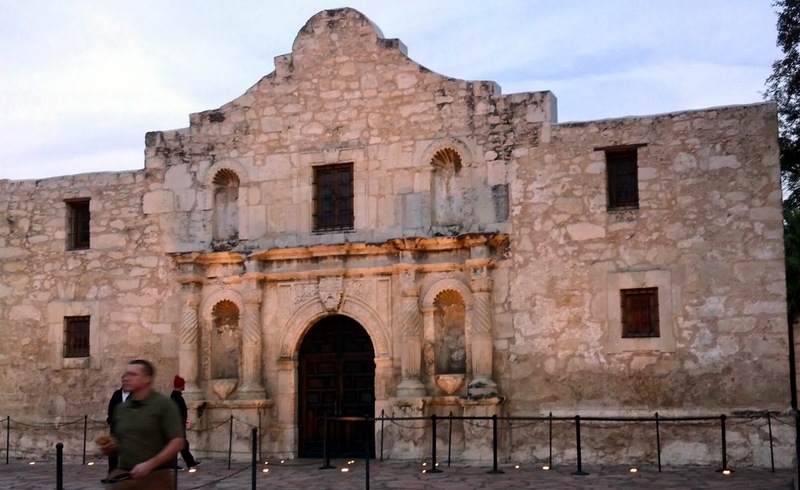 After all, the Missions of San Antonio(which includes the Alamo) are up for nomination as a World Heritage site! I gave her the nickel tour of the Birthplace of Texas Liberty, since I've been to the Alamo over fifty times in my life, and I remember most of the story, if not as colorfully as some. Also, in my mind, Davy Crockett looks just like...Johnny Cash. I have no idea why, but Ann didn't seem to notice. And the words of conversation came, in spite of all my worries. We talked as we walked along the Riverwalk, enjoying the Christmas lights reflecting off of the water. We sat next to the river to eat dinner, and happily fed random ducks corn chips until the manager asked us to stop, then giggled at being caught. Just like high school. We talked about our lives since high school, all the ups and downs and curves which drew us to our current locations. We chatted about people that we remembered from high school, a little bittersweet. Memories tend to dull over time, tarnishing with age, and no matter how hard you try, they will never be shiny again. After a few short hours, I dropped Ann off at her hotel, and we hugged and said our goodbyes. If things work out, maybe I will see her again. She seemed excited about the San Antonio area, particularly the balmy temperatures. She may come back again and bring her family. But if it doesn't work out, I am glad that I got to see her again. Friendships are treasures, no matter how far away, or how long ago. I'm an introvert's introvert like you, but I always get nostalgic for old friends around the holidays. Maybe I should look some of them up, eh?